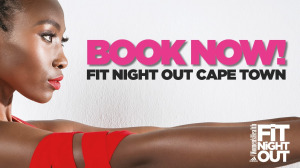 Women's Health Fit Night Out, South African's biggest all-women workout party, is set to return for a third season in Cape Town. "The idea when we first dreamt it up four years ago was to offer our fit family the opportunity not just to train live with the country’s best – the trainers they follow in our magazine, on social and online – but also to experience workouts that they might not have tried before," says Women’s Health editor Danielle Weakley. "And all this outside of the confines of a gym or studio, in the great outdoors. It’s an incredibly energising, uplifting and empowering experience. The vibe is just electric and that is as much down to the endorphins as it is down to the amazing women who come in droves to join us for one night only," adds Weakley. Women’s Health Fit Night Out launched in February 2016 in Johannesburg and now hosts more than 3 000 women at Montecasino every August. It launched to the people of Cape Town, South Africa at the Castle Of Good Hope in February 2017 and, this year, due to popular demand, the Women’s Health team is bringing a line-up of trainers to local venue Grand West. Fitsters can expect a line-up that kicks off with Ceri Hannan’s warm-up, followed by Mapule Ndhlovu. Takkies will also be there for her Rockingnheels dance class. The night will end with the S.W.E.A.T. 1 000 team, led by Paul and Andrew Rothschild. The entrance fee gives attendees access to all six classes and pop-up workouts, as well as a fitness-packed goodie bag that includes a limited-edition workout vest, water bottle, sweat towel, beauty products and more. For more information, visit www.womenshealthsa.co.za. You can also follow Women's Health on Facebook or on Twitter.